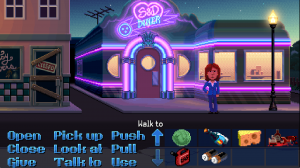 In case you’ve been stuck in a mansion of maniacs for the past 30 years, you probably already know that Thimbleweed Park (the game) is the creation of genre legends Ron Gilbert and Gary Winnick, a hilarious riff on classic adventures that takes quirkiness to an all-new level. Set in Thimbleweed Park (the village), a decidedly offbeat outpost in the American heartland that has seen better days, this is about as “traditional” as an adventure game gets. 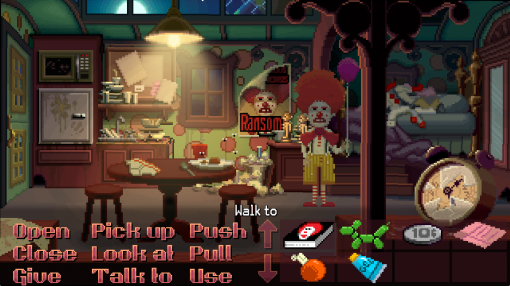 Not only does it resurrect the point-and-click SCUMM interface the two developers co-created decades ago, it presents a host of character-swapping, head-scratching puzzles to solve and wraps it in a foot-tapping, gloriously retro-styled aesthetic – although one modernized for today’s hi-definition displays. Like its forebear, Thimbleweed Park doesn’t have just one or two playable protagonists but a whopping FIVE, each with their own distinct personality, including a pair of investigators with hidden agendas, a bespectacled geek determined to be a game developer, an out-of-his-element ghost, and Ransome the rough-edged, fluently-[beeping] clown. And that’s just the ones you play. The town itself is home to a rapidly decreasing population of oddballs, many of them amusingly disguised: Groucho Marx glasses mask many a stealthy face, a young man poses as a slice of pizza, and the plumbers are dressed like pigeons. At ThimbleCon ’87 (a “Nerd and Geek Convention”) we’re introduced to a baby Batman and wannabe Star Trek groupies, and even Ron Gilbert showing off his victory dance moves. One particularly mysterious character tries to conceal his identity through local yokel verbal tics. The humorous writing ensures an ongoing source of chuckle-inducing banter, and the voice-overs are superbly suited to this eclectic cast of misfits. Full of deep perspective and intricate detail, the landscapes feature a sumptuous color palette, from vivid neon to gorgeous pastel sunset tones, and simple animations keep the world lively. Whimsical elements add personality: the smiley-face stain on the bathroom mirror, the Albert Einstein poster in Delores’s room, the hotel’s bizarre cowgirl-with-a-headless-swamp-creature fountain, and many more. The background score, meanwhile, ranges from southern-noir guitar to jaunty carnival tunes, often seamlessly transitioning between styles. Interactions take place via vintage LucasArts-style verbs at the bottom of the screen. Corporeal characters can Open, Look at, Talk to, and Push, but Franklin the ghost is able to Moan, Chill, Blow on, and Zap. Many of the puzzles have multiple steps, and clever challenges include filling up the various Tron machines with highly processed inventory goodies, insulting a circus audience, making sure certain people contract food poisoning, getting into a mad inventor’s crypt, and picking up pixel dust. Okay, the latter isn’t exactly a puzzle, but it is strangely satisfying. The unapologetically old-school approach does make some concessions to the modern gamer, mind you, like the character journals and a telephone hint system. The game even generously allows you to select from two difficulty levels at the start. Of course, there’s also a complex murder mystery going on. And though Senior Agent Ray claims that even the best adventure games “often contain overly contrived stories that make no sense,” that is not the case here. While understanding may feel teasingly out of reach for much of the game, all the narrative strands eventually come together and click in an impressive, surprising way. Drawing heavily on adventure game classicism, Thimbleweed Park fabulously embellishes it while at the same time playfully blowing a raspberry in that direction. For its brilliance in redefining the boundaries of retro-inspired art by making every single pixel count, for keeping us in stitches while leaving us guessing, and for making us puzzle our way past every new obstacle over the course of a meaty 15-plus hours of play time, we can do nothing else but tap Thimbleweed Park as our Best Traditional Adventure of 2017. Welcome back, Ron and Gary! Those of us who’ve been around since the beginning of graphic adventures (and plenty more who came along later) agree that Thimbleweed Park aces all that’s familiar about the genre, while brilliantly updating it for today’s discriminating audience. Vintage pixel art graphics are awash in colourful, gorgeously-lit HD splendour. The interface hearkens back to the Golden Era but with smoother ease-of-use and charmingly whimsical options. The story may seem ordinary at first, but the mystery immediately morphs into something odd, deeply sinister, yet still hilarious. And that’s just scratching the surface. For taking us back to our roots and reminding us just how relevant the best point-and-click conventions can be in the right hands, Thimbleweed Park stands alone as Best Traditional Adventure for readers as well as staff.